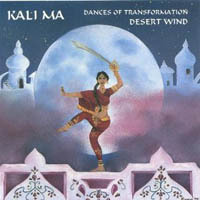 The band Desert Wind has produced several albums of original compositions containing a Middle Eastern beat, and Kali Ma is the one that I find best suited to performing Oriental dance. Although a couple of the songs in this collection are traditional Middle Eastern songs ("Habena" and "Mastom"), most of them are Alan Bachman's original music based on underlying rhythms such as chiftetelli, Khaleegy, maqsoum, and karsilama. The musical style has a pleasing New Age flavor, and would well for fusion performances. This collection consists of music arranged by Alan Bachman into a New Age style. Two of the songs are traditional ones from the Middle East, but most of them are original compositions by Alan Bachman. There is a very definite modern-day synthesizer and electronic keyboard sound, although a couple of acoustic instruments (flute and drums) are also used. The result is a New Age flavor of sound. Most of the songs pick a particular Middle Eastern rhythm and then stick with it throughout which would work well for beginning dancers. However, a couple of the songs are more complex with some rhythm changes and breaks that be better suited to more experienced dancers. Several of the songs are fairly long. These could be good for practicing finger cymbals or dance moves either in the classroom or at home, but I wouldn't recommend that beginners use anything longer than 3 or 3 1/2 minutes for performance because it's hard for a beginner to keep a dance interesting for much longer than that. I also wouldn't recommend creating choreography for students to anything longer than 3 1/2 minutes because longer songs are too much for many people to memorize all at once. Kali Ma. A chant repeating the name "Kali Ma" over and over again. Rhea Kronia. "Rhea Kronia, Mother of Time, Goddess of Winter - transform divine, Clearer of old life - consumer of fall, Preparer for new life, her love is for all, Rhea Kronia." Into The Night. "Bless the night, Our pure light, Guides the way, Our new day." Moon Goddess. "Goddess of moonlight, Dancer of our night, Giver of all life, Blessed be." Wind Dancer 3:46 U.S.A. Yes Not applicable Good entrance music to maqsoum rhythm. One of my favorites. Kali Ma 3:42 U.S.A. Yes Not applicable A chant, and therefore repetitious. Chiftetelli rhythm. Rhea Kronia 3:22 U.S.A. No In English Quick pace. Ode to a goddess. The Vision 3:55 U.S.A. No Not applicable Slow maqsoum rhythm. Gentle, flowing melody, suitable for veil. Exploding Star 4:55 U.S.A. No Not applicable Quick, spirited. Good between two slow numbers, or as a finale. Twilight Mist 5:09 U.S.A. No Not applicable Medium speed 9/8. Good for practice because not too fast. Pleasant melody. Scorpio Rising (Dance Version) 3:13 U.S.A. Yes Not applicable Khaleegy rhythm. One of my favorite Desert Wind songs. Moon Goddess 3:32 U.S.A. Yes In English Slow maqsoum. Nice for veil or practicing finger cymbals. Moon Dance 3:00 U.S.A. No Not applicable Mysterious. Could be good for veil, floor work, or standing undulations. Nice. Well named. Sunset Shadows 5:15 U.S.A. No Not applicable Not recommended for beginners because of periodic rhythm changes. I found it a little boring. Into the Night 4:41 U.S.A. No In English Chiftetelli. Duet of female vocals. Flows, suitable for veil. Pretty melody. Wind blowing sound effects. Temple Gardens 4:24 U.S.A. No Not applicable 6/8 rhythm. Lyrical melody. Tribal Fusion 4:43 U.S.A. No Not applicable Medium speed. Could use between two slow songs. Tequila Sunrise 3:44 U.S.A. No Not applicable Medium speed. Goddess Dance Cycle: Habena 3:39 Egypt Yes Yes Maqsoum rhythm. Classic Egyptian song. Improvisational section in middle. Goddess Dance Cycle: Isis Chiftetelli 3:22 U.S.A. Yes Not applicable Beautiful song to chiftetelli rhythm. One of my favorite Desert Wind songs. Goddess Dance Cycle: Mastom 3:31 Iran Yes Yes Well-known Persian song performed with New Age flavor. You enjoy the instrumental style of New Age music. You're looking for songs that aren't too fast that you can use for practicing dance moves or finger cymbal rhythms. You want to dance to alternative music that is "Middle Eastern friendly" rather than to traditional Middle Eastern songs. You're a Pagan with an interest in music that celebrates Goddess. The vocals on this collection would probably appeal to you. You don't care for synthesizers. You prefer to use music played on traditional acoustic instruments such as oud, kanoun, rebaba, or ney. You're happiest using music with a very ethnic sound or Egyptian big-orchestra sound..
You're a member of a fundamentalist church/mosque/synagogue for an Abraham-based religion and you would be uncomfortable with music whose lyrics celebrate a Goddess. I find the unique musical arrangements to the familiar Middle Eastern songs in the "Goddess Dance Cycle" medley to be quite appealing. I very much enjoy several of the original compositions that appeared on this collection, particularly "Isis", "Wind Dancer", and "Scorpio Rising". This album contains interesting music for dancers seeking a fusion of Middle Eastern rhythmic foundation and Western orchestration. The liner notes include the lyrics to the three songs that have vocals. The songs employ a variety of rhythms and tempos. Many of the songs are played at slow or medium speeds with easy-to-hear drumming, making them suitable for classroom use when teaching finger cymbals. Some of the songs run a bit long, which makes them unsuitable for certain uses. Beginning solo dancers really shouldn't use songs longer than about 3 or 3 1/2 minutes, and I avoid using songs longer then 3 1/2 minutes when I create choreography because it's so much for students to memorize. Although the goddess-oriented songs are pretty, I would hesitate to use them for performances before the general public unless I knew it to be a goddess-friendly group such as a Pagan gathering. This would particularly apply in a community with a heavily fundamentalist Christian or Muslim population, because the lyrics might be offensive to audience members who are highly committed to these patriarchal religions. I have many of Desert Wind's CD's because I enjoy the musical style of this band, and I consider this one to be the friendliest to Middle Eastern dance. The dance style that would fit this album best is fusion, due to the fact that the music consists mostly of Alan's own compositions. Even the traditional songs (Habena and Mastom) are played using instruments that gives them a non-traditional sound. I find the musicianship on this album very appealing. I personally tend to use it more for listening than for dance performance, but I do sometimes use the final three tracks for dance. I've had minimal contact with Alan. I have had brief conversations with him while buying his music at local dance festivals, but I've never had a chance to get well-acquainted with him and I've never had an opportunity to work with his band for a performance to live music.